Edraw offers a visualization solution with free templates and examples. 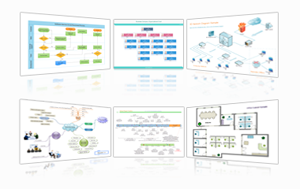 Designing and diagramming have never been easier. What's the solution? Buy separate graphics programs for each department's individual needs and hope your company approves the purchase? Buy one graphics program which suits one group but forces the others to compromise and make do? What about none of the above? Edraw Max lets you create charts and diagrams to suit all of the above requirements and much more. With over 12500 vector symbols included and an extensive library of pre-drawn illustrations, you will never have to purchase another graphics program ever again! With the help of dynamic instructions and easy to use interface, everyone could create nice-looking diagrams without professional skills. Each diagram you start with a built-in template that instantly shows abundant pre-drawn shapes and handy tools, through which a nice looking diagram could be done in just minutes. The best strength about Edraw Max is its flexibility. 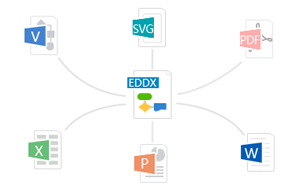 You can export in any graphics format, Word, PowerPoint, PDF, SVG or EPS, print with full WYSIWYG support, or share with others as a Word, Excel, PowerPoint file. You can even link diagrams to underlying data to provide even more detailed information to your audience. A group of nice themes include rich sets of improved effects, fonts and color schemes, which help apply a fresh and professionally designed look in just one or two clicks. You don't have to be professional in designing attractive diagrams.